Mac: When it comes to email clients, there are a ton of options out there. For the past week, I've been using Boxy. Originally launched in late 2015, the company put out version two this time last week, which adds a lot of new features to the original product while maintaining the stuff people loved about the company's initial offering. Boxy only works for Gmail (or Google Apps accounts), so if you don't have a Gmail account then you're SOL when it comes to using the program. A redesigned white theme and new crimson theme. Saved Searches. If you find yourself always searching for the same things in your inbox, with Boxy you can now save some of those searches to make the process a little faster. Global notifications. The newest version of the app has a revamped notification system that can give you notifications for all your accounts connected to your Boxy account. New Status Bar Menu to quickly see and access your accounts. Brand new multi-account system. The system is now much faster and more reliable than the previous version when it comes to handling multiple accounts. I actually never tried the original version of the app, but really enjoyed taking version two out for a spin this week. Basically, if you're a fan of Google's Inbox app on your phone or the web, you're probably going to love what Boxy has to offer. 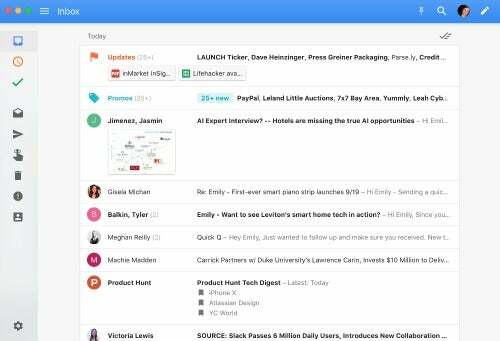 The $9.99 app is an Inbox by Gmail client for Mac and brings with it the ability to snooze emails, pin important emails, and quickly navigate through your inbox. By and large, it's essentially taking the functionality of Inbox by Gmail and bringing it to a native web app. So, most of the features I'm about to explain are Inbox by Gmail features as well. This is just taking those features and having them run in a native app on your computer. Just like with Inbox, images and attachments are automatically pulled out and shown inline when you're reading messages, and are also shown within your inbox while you're scrolling through. When I'm not at Lifehacker, I write a lot of about drinks and cocktails. One thing I really enjoyed about the app was that it showed me images of cocktails that had been sent to me by bartenders and the like to check out. I get a ton of email, and that not only highlighted those submissions but also allowed me to get a feel for what I was getting into before even opening the email. Sure, opening and scrolling down to see pictures might have taken an extra 15 seconds, but when you're talking about a lot of messages, saving that time was pretty awesome. The whole experience is fast and clean. 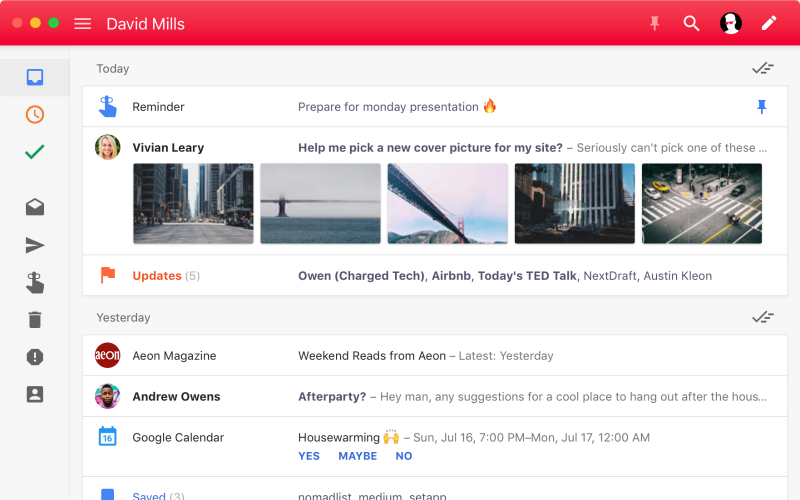 I'm traditionally a user of Gmail's web client, and I felt a lot more efficient using Boxy this week when it came to responding to email and going through my inbox. Everything is just faster with the native app than it is on the web. Like Inbox, individual messages are also grouped together in some cases into groups such as Social or Updates. If you end up with a ton of newsletters and the like in your inbox, it can be nice to go through similar things all at once. If you hate the idea, you can also disable the feature. Emails by the same sender are also grouped together. For instance, it did this with all the Medium Digests I get but never open. Clicking on one shows me them all, and I can dismiss the whole group at once rather than going through each message individually. And if you're dealing with multiple email accounts on a daily basis, getting notifications from everything while just having a single app open is pretty killer. A new feature in version 2, the app will let you know when you get a message in any of your accounts, not just the one you happen to have open. That's super helpful when you're trying to juggle four email accounts and want to make sure you don't miss anything, though unfortunately, you can't view all those inboxes at once. Just like with Inbox, reading email opens the message up inline in your inbox, so you never really leave it. For instance, if I open an email it will for all intents and purposes stay exactly where it is on the page, just expand so I can read it. When I'm done, if I keep scrolling I'm right back in my inbox again. If you mark an open email as "Done" then it gets removed from your Boxy inbox and moved to a "Done" folder. Yes, you can archive messages everywhere, but more often than not I don't actually want the email to go away, I just want some way to indicate to myself that I've dealt with it. The Done options serves that purpose, and for me makes my inbox feel like a to-do list of sorts where I can picks and choose what tasks I want to work on and then mark items as done as they are finished, rather than having to sift through pages and pages of my inbox to make sure I don't miss anything. When it comes to the web client, that "Done" folder is your archive folder, so you want to be careful about using it on emails you need to come back to later. Google's Reminders feature also works directly within the app. If you're like me, and end up with a huge list of things you need to remember to do each time you navigate your inbox, then the feature can come in super handy. Again, you can set reminders from almost anywhere (including Inbox by Gmail), but doing it natively in the app is just really nice and efficient. That depends a bit on how you use email, and whether or not you enjoy what you're using now. For me, this a step up from the traditional web client and runs much faster than using Inbox on the web. Multiple account support is a great feature if you're juggling a work and personal email. Ten bucks isn't a huge price for software, but you can also get a lot of Boxy's standout features just using Google's Inbox web app. 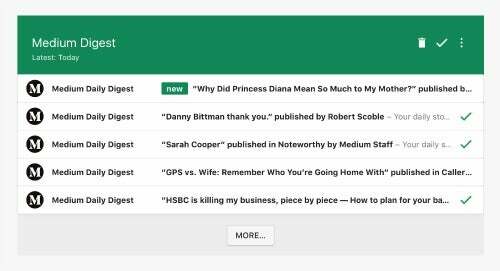 If you're not an email power user, then Google's web app is likely just fine for your needs.